Mary Garvey, General Manager, Roscommon University Hospital said, “There will be people from all parts of the country in Knock on Sunday. We will all be hoping for a repeat of the summer sunshine and for everyone to have a fantastic experience and come home safe and happy. “In the unlikely event that you or a family member picks up a minor injury that needs hospital attention, remember that our Minor Injuries Unit can treat a wide range of minor injuries including broken bones, dislocations, sprains, strains, wounds, scalds and minor burns that will not need admission to hospital. Staff in our Minor Injury Unit perform x-rays, reduce joint dislocations, apply plaster casts and treat wounds by stitches or other means. For further information and details on the Roscommon Minor Injuries Unit, go to www.saolta.ie/hospital/ruh. 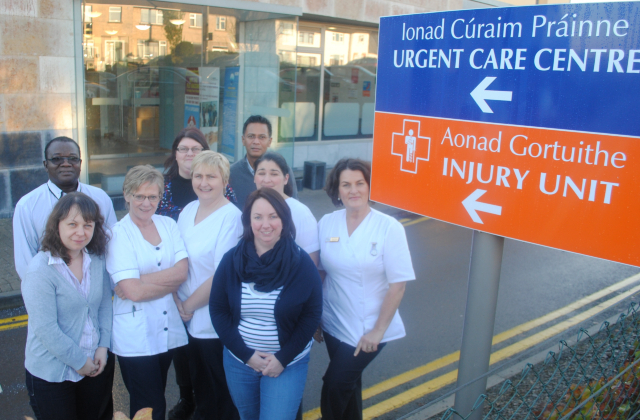 Staff from the Minor Injuries Unit at Roscommon University Hospital. The Minor Injuries Unit is open from 8am until 8pm, seven days per week to treat minor injuries in adults and children over the age of 5.